The CA-15 scope mount is a fore and aft adjustable, cantilevered optics mount designed to accept multiple optics on a single modular base. 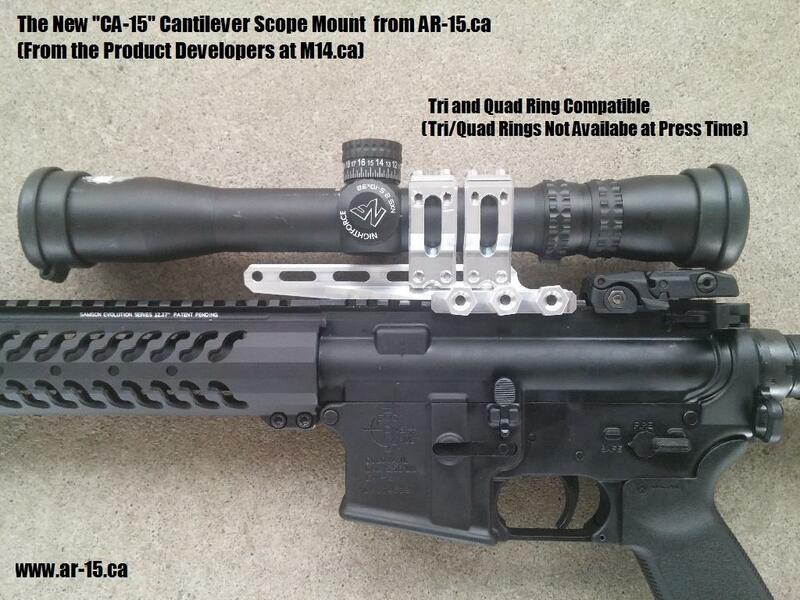 Thus, the CA-15 is a cantilever platform for 30mm and 1" scopes, micro red dots and tubular red dots. This one design is also a combination of traditional 2" and 3" cantilever scope mounts because it is adjustable. It is precisely adjustable for ring spacing and placement and offers end users the greatest choice mounting various optics, without purchasing 2 or 3 different mounts. Now, one mount can run various optics at a significant cost savings to the end user while offering a superior level of standardization for law enforcement and military applications. Made in Canada from U.S.A. sourced 7075 aluminum, 4140 nitrided steel and Grade 2 titanium. The CA-15 offers compatibility with a wide range of optics in one versatile, scaleable, modular and upgradeable design. 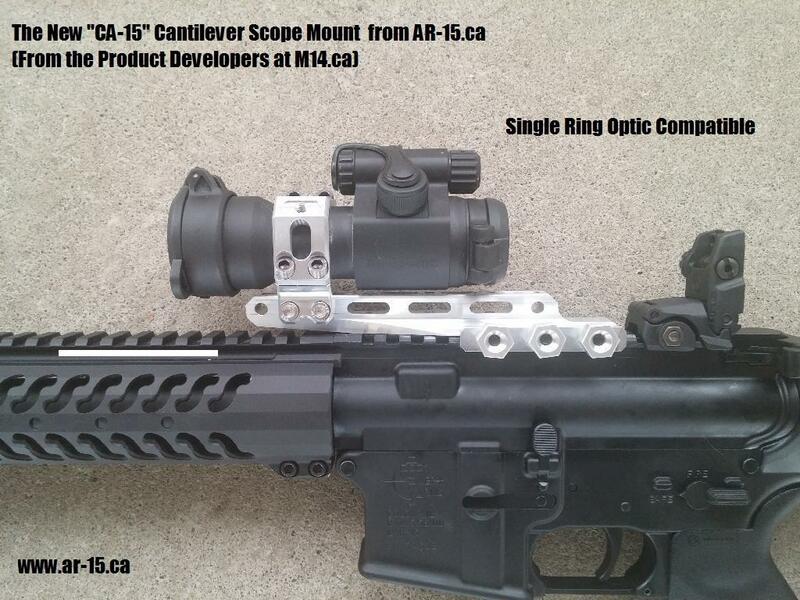 From the manufacturer at M14.ca and T97.ca, the new CA-15 cantilever optics mount (available at www.AR-15.ca) is one of those design concepts that appears to “elegantly simple,” however, some complicated and sophisticated design and engineering choices were made to end up with this simple-looking but sophisticated adjustable cantilever optics mount. This new generation cantilever design may appear similar to some of the other cantilever mounts available, but this new mount has specific differences. Our engineering summary delves into detail. PRE-ORDER ONLY. 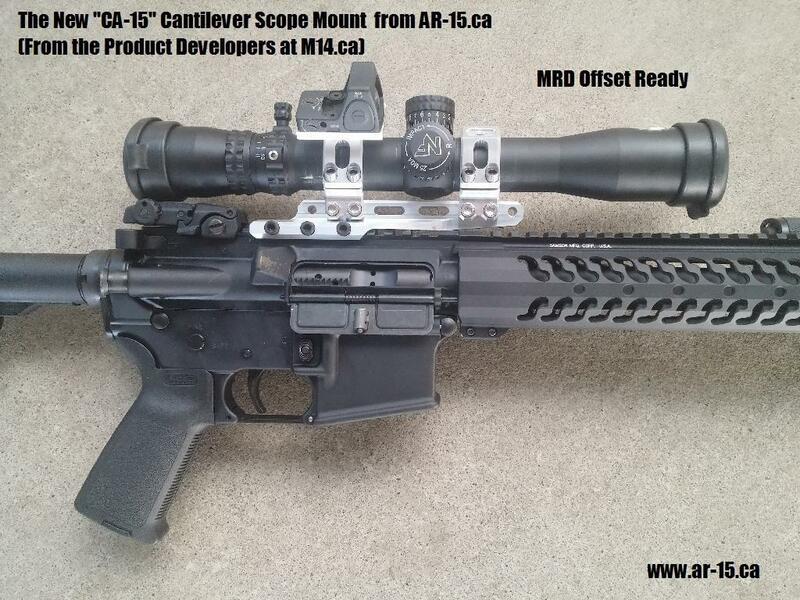 CA-15 CANTILEVER SCOPE MOUNTS SHIP APRIL 2017. (Prototype images only. See renders for accuracy. 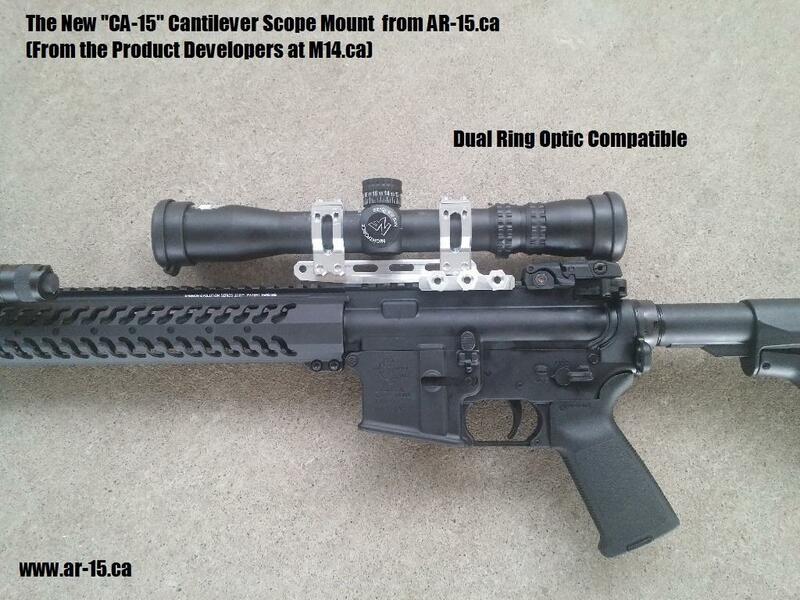 All CA-15s ship Type II Milspec anodized, black with two rings only). First and foremost, this new mount is adjustable for ring spacing and placement. Given the wide variation between turret size and location, and front and rear bell spacing on various scopes, this feature allows one mount to fit a wide range of scope models. Internal spacing between the rings can be set between a minimum of ¼” to a maximum of 3 ¼”. This versatility allows fitting many different types of optics to this one mount. Instead of two traditional 2" and 3" offset cantilever scope mounts, the CA-15 offers a comparable range of adjustment in one design. For organizations or individuals with several different optic and firearm choices being deployed, this one mount provides standardization across multiple platforms. Customers with narrow turrets may have enough space to use 3, or even 4 rings. 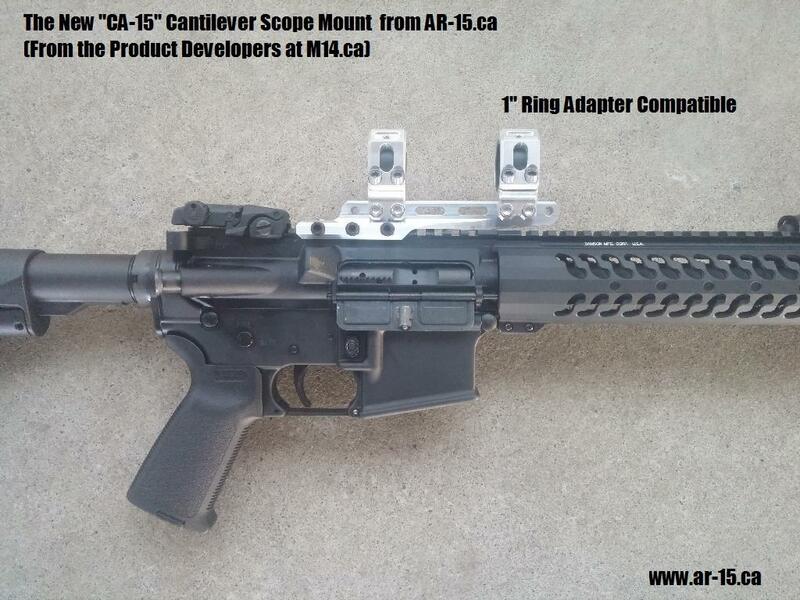 Once the rings are locked to the scope tube, the CA-15's adjustable ring to rail mounting interface provides easy linear spacing adjustments in 3/8” increments (i.e., rings locked to scope tube can be moved fore and aft on the CA-15's tapered wedge cantilevered base, offering a convenient and fast way to achieve perfect eye relief by sliding the optic and rings assembly back and forth). The rail length of 5”, with tapered ends, and with 3 ¼” maximum spacing between rings, allows fitting a wider range of scopes with various bell constraints. The new wedge shaped / tapered rail mounting interface provides mechanical force downwards between the ring and the rail, securely locking the rings to the mount, almost as if they were monolithic. Given the large mounting surfaces and the precise CNC machined fit between the rings and the rail, and the mechanical wedging action provided by the tapered/wedge shaped interface, these rings are connected to the rail as solidly as monolithic designs with the bottom section of the rings integral with the mount. No other removable ring mount offers this particular combination of adjustability, strength and security. This new interface, fitted with 1” long mating surfaces, wedges the rings securely to the rail, providing precision and strength to the ring to rail connection so ring rocking or rotation is absolutely minimized. (The rings are contoured, 1” at the base, ¾” wide at the scope tube mounting surfaces). Three, custom made, flush mounted, #10 4140 cross bolt mounting screws, which are tightly fitted into the holes in the rail, secure the rings to the rail. 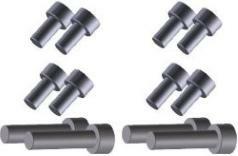 These screws are also designed to act as recoil lugs and are further supported by one titanium recoil lug, guaranteeing absolutely zero fore and aft or rotational movement once the rings are tightened down to the buttressed, wedge shaped cantilever rail. The CA-15 ships with three, flush mounted, #10 4140 cross bolt mounting screws, which double as recoil lugs for the Picatinny to weapons platform part of the mount. One additional integral titanium recoil lug is secured into the bottom of the mount, providing substantial recoil force resistance to the interface for a total of 4 recoil/shear lugs. The strong and light 7075 alloy side plate is full length, with a reinforced top lip design that is much more solid, precise, and stronger than the usual tapered/slip joint interface most other designs use here. This new design requires more precision in mating surfaces, but once locked up, is stronger. These multiple design features ensure the mount will securely stay in place, and survive the harshest recoil in both directions, from firing and from bolt carrier counter recoil. The mount provides an industry standard/AR compatible height to center of the 1" and 30 mm rings of 1.5”. The CA-15 provides adequate height and forward spacing behind the mount and under the rear scope bell of most optics for an optional BUIS, if desired. 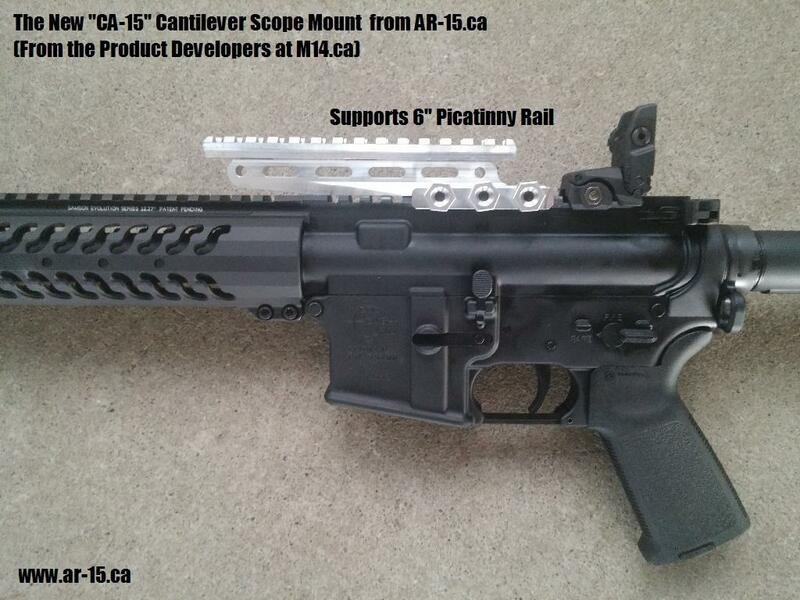 The CA-15 is CNC machined out of 7075 aluminum and uses 4140 cross bolts. 7075 aluminum was selected for its key properties; high strength, stress resistance, workability and improved stress-corrosion resistance. By using a large, solid rail with large ring to rail 4140-T shaped through bolts on each ring, precision CNC contact surfaces, by reinforcing the Picatinny rail to mount interface, and by using high quality, high strength 7075 alloy materials and Type II hard anodizing, this design offers the maximum blend of strength to weight, in an elegant, versatile, and adjustable mount that is suitable for a wide range of optics. 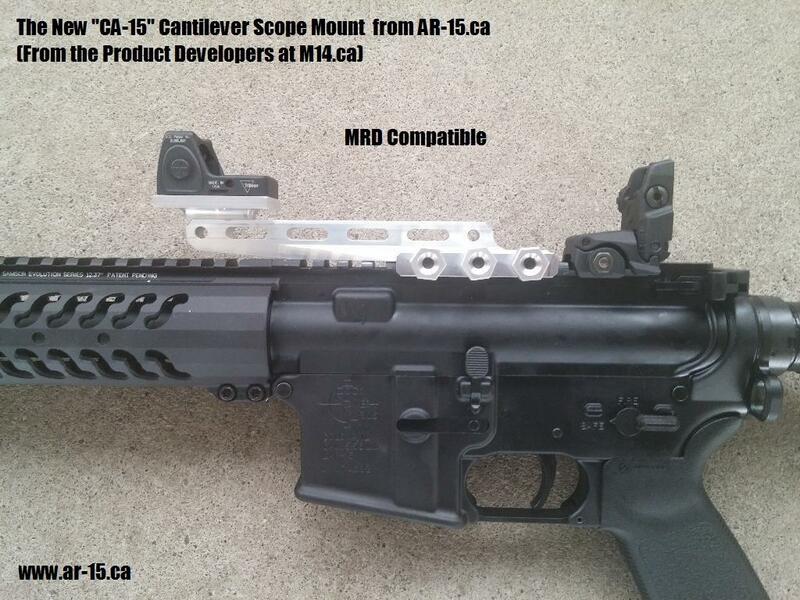 Compatibility: Fits all AR-15 family of rifles and rifles with AR15-type flat tops.